I’ve had a great time learning how to write over the past few years. Now it’s time to actually do the deed, so to speak, and publish something! 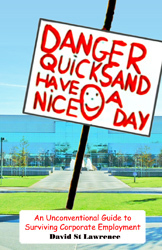 Danger Quicksand – Have A Nice Day strikes off in a different direction than the usual job-hunter’s bible. Most career advice books seem to operate on the basis that you can find a pony in your cubicle if you shovel enough horsepoop away. I am taking a different viewpoint, based on many years of earnest and hopeful observation. If they want you to have a pony, they will hand you the reins when you join up. As a result, in my book I have assembled the key strategies you should employ to ensure that you get the job and the pony you deserve, and what to do if things are not working out. In order to help people, I need to get this book into their hands. I’ve made a start, because 900 1204 people have already downloaded it as a PDF file. Now, what I need to do is put out a book to carry my message where broadband internet can’t. Since most of you have at least one book in you, you may wish to follow along as I blog this new adventure. You can second-guess me, offer suggestions, and generally feel free to be thankful that it isn’t you careening along the cliff edge of publishing a first book. We could title this series of posts: On the edge of madness…or What was he thinking… But, we won’t. manuscripts to publishers, and grow old waiting for good news. a four-color cover delivered into my hot little hands for about $4.00. I am now waiting for samples from at least five printers. I asked them to send me examples of their best work. things which may help those of you who decide to self-publish. Update: My download count is now up to 1204 copies of Danger Quicksand – Have A Nice Day. Words fail me. I am very grateful. Thanks. in March. Check back next week for exact availability. Thanks for following through and making this into a book. I am one of the 900 who has downloaded the book, and thoroughly enjoyed the wisdom you shared. I was sharing some of your principles with a friend at work, and the next thing I knew he grabbed the copy I printed out and made a photocopy. I have no doubt that your book will sell well, and I expect I’ll be buying a copy. Vince, That’s very encouraging! Thanks for the good news! If you can send me an email on how this book has helped you, you will have earned yourself one of those cups. I’ve got two typographical suggestions for you that I think would improve your book. Firstly, consider full justifying the text instead of leaving it ragged on the right margin. It’ll look more professional, and make it easier to read. Secondly, whenever possible, consider tweaking the text so that you avoid widow and/or orphan lines (one line of a paragraph left alone at the top or bottom of a page). Definitely avoid orphaned subheads (for example there is one in the current PDF on page 67 [page 81 in the PDF]). I appreciate your taking the time to let me know. You will be happy that text is fully justified in the current version and the typeface is Palantino, which makes for a pleasant reading experience. I have also gone through and removed orphan lines and words. I made a judgment call on releasing the downloadable pre-press version while there was still work to be done. When the paperback comes out, the free downloadable version will be updated to reflect all changes incorporated in the book. As I said before, I will keep a free downloadable version online. I think it will increase sales of this first book, not reduce them. We will soon see. David … well, obviously I did not ‘get here’ in time to download the PDF – and you’re not selling a book yet – BUT, I would like to read what you put out. Is the PDF still available.? IF so, how about selling it through the PayPay system? You don’t have the same outlay costs as a paper-based book … and there’s no reason to no offer both platforms. If you’d like to know more .. just email me. Leslie, I committed the cardinal sin of not providing links in every post. The free download version of the book is still available and so is the free PDA version of the book. Download them and feel free to pass them on to your friends. You will be able to pre-order the paperback soon for delivery in March. Check back next week for exact availability. We’ve been in touch through Anita Campbell and I’ve been following your “adventure” with interest. I’m about to place a link to this series on our new blog: A-ha! (Authors – helping authors), but I came across the comment from Michael Cleverly and your response about using “justified” text. If it’s not too late, I’d like to urge you to reconsider. Studies have shown that blocks of justified text are actually harder to read, because they result in odd spacing between words and excessive hyphenation by wordprocessing and page layout programs. The frequent wider spaces often line up from one line to another, producing distracting visual “rivers” of empty spaces winding down the page. It takes a lot of careful, manual adjustments of kerning and tracking to avoid these problems. Take a look at some of the most beautiful, well-designed books produced in the last couple of decades: Edward Tufte’s series of books on information design (especially The Visual Display of Quantitative Information, 2nd ed.) and Douglas Holleley’s wonderful resource for self-publishing, Digital Book Design and Publishing. All printed with left-justification, ragged-right. All self-published, as well, by the way. Her article has been adopted and posted on the official website of the U.S. Court of Appeals in Chicago, available at http://www.ca7.uscourts.gov/Rules/Painting_with_Print.pdf. Check it out. She offers lots of useful typographic advice and research to back it up. So there are opinions on both sides. I’ll go with Robbins, and Tufte, and Holleley. But I won’t hold your choice against you. Your book and your blog are both inspirations to all of us who write and publish.